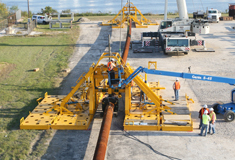 The Oil States Deepwater Pipeline Repair System (DPRS) is an in-line repair system for deepwater environments where a larger section of pipeline needs to be replaced than can be accommodated by a clamp. The DPRS utilizes two outer-lift frames to elevate the pipe and provide rough alignment. Two inboard index frames provide fine alignment for up to 25″ of misalignment and a landing base for the dual-grip and seal alignment frame. The grip and seal connectors are pre-attached to a spoolpiece. Once lowered into position, they are stroked onto the existing pipe. The collet grips and seals are actuated, and seal integrity is verified. All operations are carried out via ROV. The lift and index frames are then retrieved to the surface for reuse. See dual grip and seal animation here. Permanent inline repair system with low overhead height. Modular design allows fast breakdown and shipment via truck. Accommodates varying pipe sizes and pressures. Simple, ROV installation and interface.